This place is located in Barsha and parking is not that easy to find in the evening, though I was lucky enough to find one soon. It's a small place but has nice interiors and a see-through kitchen. As for starters we ordered the chicken wings in hot sauce. The wings were good and really soft, but they weren't spicy at all. As for the taste, it was good, but I was expecting them to be at least a little spicy. Even my friend who doesn't eat much of spicy food, didn't find them spicy at all. They have a good selection of pizzas. And an interesting fact is that they can make your pizza half-n-half, i.e. you can choose two different flavours for your pizza. For one of the two flavours we selected the 'Santa Fe' which has chipotle pesto sauce, mozzarella cheese, chicken sausages, onions, corn, chilies, and tomato; and for the other one we decided to ty one of their newly launched white sauce based selections - the roast garlic chicken. 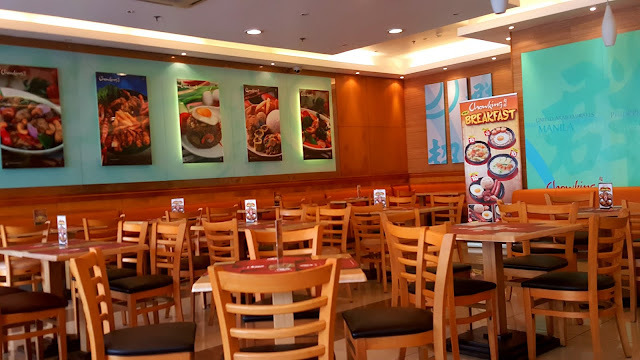 Chowking is well- known for its Chinese and Oriental food. We went there on a weekday for lunch, and it wasn't crowded at all. They have comfortable seating and a lot of natural light coming in. To start with, we ordered a Chicken Siomai which is a dumpling. The chicken was well cooked and it had a nice taste to it. It was served with a spicy chili oil which really enhanced its flavour. Another one of my all time favourite is the Nasi Goreng. So we ordered one. It looked so tempting and it surely lived up to it. The rice wasn't as sticky as I'd usually find it elsewhere, but it was delicious nonetheless. Then we ordered a chicken schezwan stir fried noodles. This too looked tempting, but it didn't taste all that great. Given the taste of the Nasi Goreng, I was expecting better. Also, the chicken in this felt a bit stale. 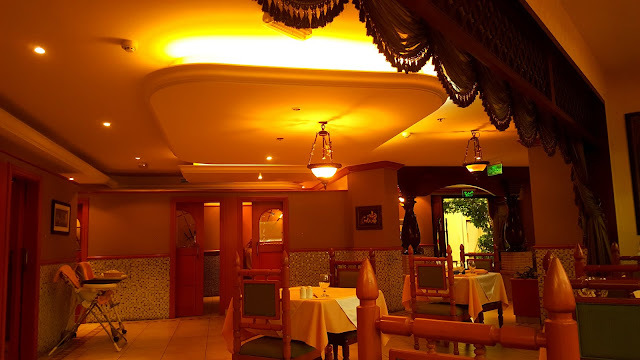 We had gone for a visit Jebel Hafeet and on our way back decided to make a halt at an Indian restaurant in Al Ain. After seeing a few, we settled on this one. It was a bit hard to locate inside the mall itself. It was smaller fro inside than what we expected, but the good thing is that they also have private partitions with curtains for families. We ordered a kadhai sabzi and a royal mughal special vegetable. Also, a jal-jeera as for the drinks. They have complimentary roasted papad which kept us busy as we waited for our food. We were thirsty and the waiter took a long time to get us the water which was a let down to start with. Also, the jal-jeera took quite long. It was a little mintier than what I've usually had, but good. Then came our food. He had messed up the order a bit and instead of the kadai sabzi got the tawa sabzi. We were really hungry so we didn't ask for a replacement. The kadai sabzi was okay. Wagamama - a restaurant that's famous for Japanese inspired Asian cuisine - I wanted to try for a long time, and finally got a chance to go here. It is located in the 'Golden Mile' mall in Palm Jumeirah and has ample parking in the basement. They have a nice seating arrangement which is partially enclosed and a part that is partially open, as well as outside seating. To start with, we ordered Edamame and a Lollipop Prawn Kushiyaki. For the drinks we had the super green and a 'fruit' fresh juice. Once we were done with the order, the waiter wrote the code for our respective dishes on our table mats so that the server knows which one to serve whom. I found this bit really interesting. 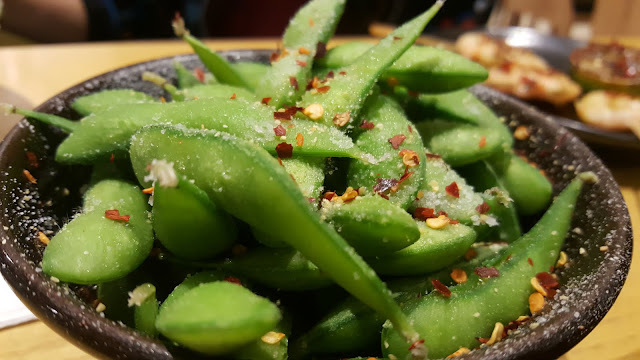 The steamed Edamame beans are coated with chilli garlic salt and tasted fresh and spicy. The Lollipop Prawn Kushiyaki are skewers of grilled prawn marinate in lemongrass, lime and chilli and were really delicious. I would certainly recommend it. It's that time of the year when the city is abuzz with food festivals all over the city and one simply cannot miss the Etisalat beach canteen. There are loads of restaurants, many of which have new and interesting concepts. This post is about Trèsind. Trèsind is almost synonymous with molecular gastronomy in Dubai and I was waiting to try this one out since a long time. 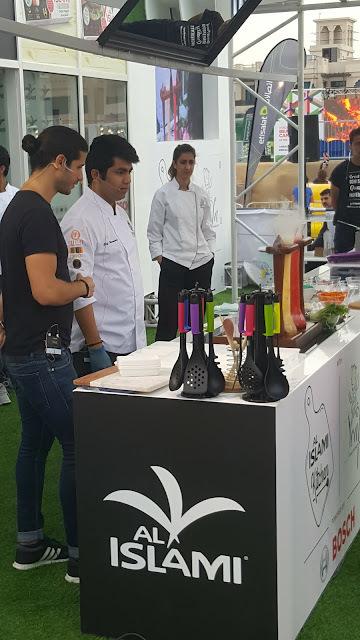 Their outlet in the Etisalat beach canteen also had live cooking shows and their head chef was making interesting items for the audience. With Trèsind you are spoilt for choice; finally we settled on a few. Bateel - a name synonymous with dates and date products in the Arabian land. They also have their cafes where usually I've had just tea or coffee; until this time where I tried out their Mediterranean cuisine. As soon as you walk in, you notice the lovely ambience. It feels really classy for a "café". The staff greeted us and showed us to a table. 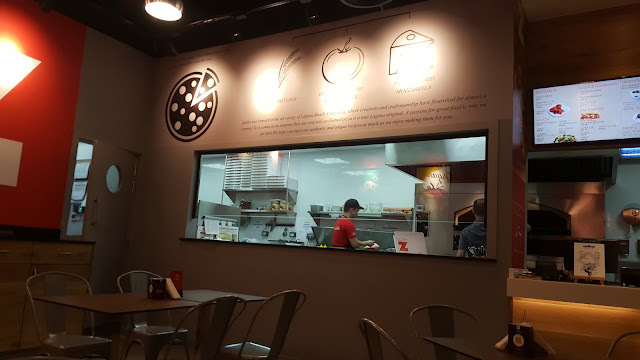 They have a good selection of salads, pastas, sandwiches, desserts and more. As we waited for our food, they served us a complimentary bread basket which had 4-5 varieties of bread. 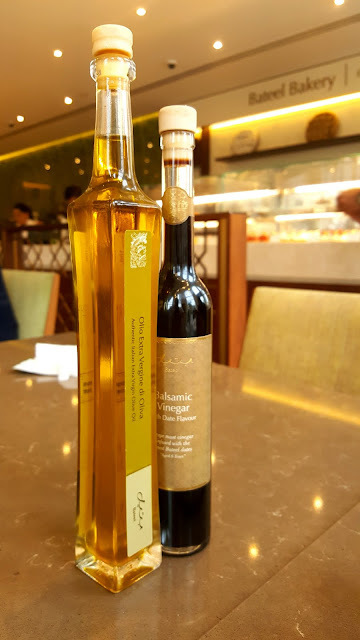 It was soft and tasted well with the olive oil and balsamic vinegar which they have on the table. Our order took quite some time to be served. We had ordered Bresaola, red quinoa and avocado salad. The salad looked really tempting, but in terms of taste, it could have been better. The bresaola was good but the rest of it felt a bit dry.